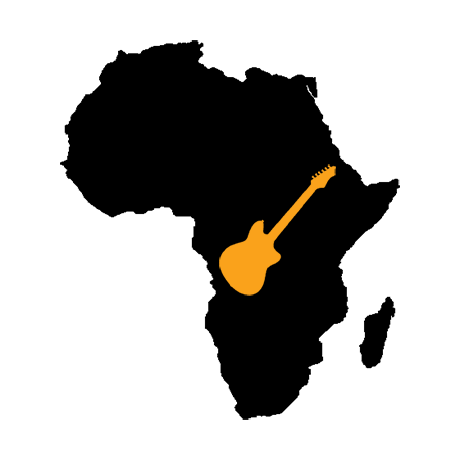 Check out this guide on the electric guitar of Africa! It might be able to help you reproduce your favorite African tones, or even create new ones. In theory, you can play any kind of guitar if you have the style down, but traditionally it’s solid body electric guitars. Why? They are sturdier, not prone to feedback and most importantly, they have the tone. What kind of tone that is, you may ask. Well, the resonance of a solid body guitar is at a much higher frequency than that of a hollow body (remember, the strings and the pickups are in contact with the guitar body, so while wood species don’t, the construction itself still does matter to an extent), so you get a somewhat thinner, brighter sound with plenty of sustain, yet with a percussive attack to the notes you play. This brighter sound is very important when you need to cut through the mix to be heard over several other instruments. While generally pickups have a rather great impression on your tone, if you play through certain amps (discussed in the next paragraph), the big differences between all kinds of pickups will diminish, and you can look at their tone shaping capabilities more like you use spices when cooking. That’s why you can see soukous players using everything from covered or open humbuckers to regular Fender single coils or even active EMG pickups. For a more detailed guide on what guitar pickups should you get, please check out this article. Probably the most important element when it comes to getting that sought after soukous tone. From about the late 70s, the single most popular and vastly used amp is the Roland Jazz Chorus JC-120 (and all the other variants as well). Vieux Farka Touré, the son of the late great Malian master, Ali Farka Touré called the sound of this amp “the sound of the desert”. It’s a dry and biting, but at the same time bright and rich tone, with lots of punch and presence. Other solid state or tube amps work well too, the key is to be able to get a pristine clean tone. Don’t be afraid to use a seemingly thin and shrill, “wiry” tone, it will fit amazingly well when you play in a band, because this way you will occupy a certain frequency range no other instrument is capable of producing. The most popular effect used in soukous is delay (echo). It’s usually set to just a little longer time than a regular slapback echo. You can use it and some amp reverb when playing live, or you can go completely dry too, which is preferred when you record. With adding delay/reverb later in the mix, you have a better control over your sound. Other popular effects are chorus (usually the rich built-in chorus of the Roland amps), flanger and phaser. They are not necessary but they can be used for different tonal colors. Some styles use distortion or overdrive too, but even in soukous, a fluid, fuzzy kind of tone appeared lately. That’s when the “hated” distortion of the Jazz Chorus comes handy, but you can of course use the dirt pedal of your choice as well. Traditionally, soukous bass players tended to use passive bass guitars, but in about the last 20 years, it’s kind of an “anything goes”. For example, Oncle Bapius (aka Mwaka Mbeka Pierre) of the band Zaiko Langa Langa went from a Fender Jazz Bass to an active Warwick Streamer. As far as effects go, they use them sparingly, for and added “spice” but not more. Sometimes in the sebene part of the song, you’ll hear them engaging a time based effect like a chorus, a phaser or even a short, slapback timed delay, but they have to be set in a way to not compromise the groove, the pulse of the rhythm, so even people on the dance floor don’t get confused about where the beats are. You can actually use even a distortion of some kind during these parts; while it’s not quite common, it’s not unheard of, either. But most of the time when it comes to soukous, it’s a well dialed in, midrange rich tone on a four string, with no effects whatsoever. But if you can put your heart and soul in it, you can get inventive and go for something that’s actually unique.